Green leafy vegetables like spinach have high concentrations of polyphenols, vitamin C and magnesium. 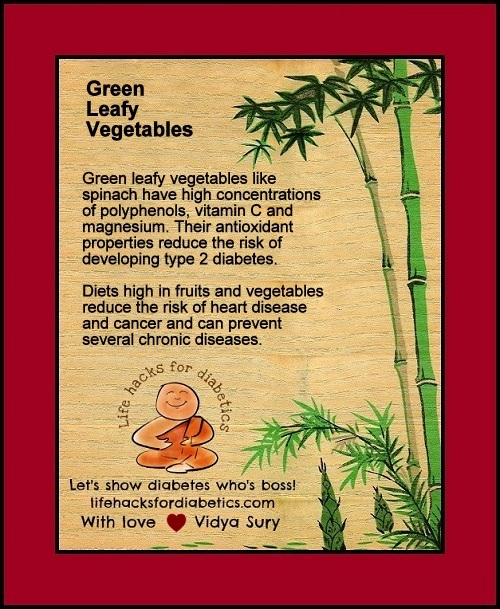 Their antioxidant properties reduce the risk of developing type 2 diabetes. Diets high in fruits and vegetables reduce the risk of heart disease and cancer and can prevent several chronic diseases. I love green vegetables, especially broccoli, sprouts and cabbage. Unfortunately, I am not a fruity person and hardly eat any.